Among proponents of the theory that Jabal Maqla/al-Lawz is Mount Sinai, three proposed Red Sea Crossing candidates have emerged. 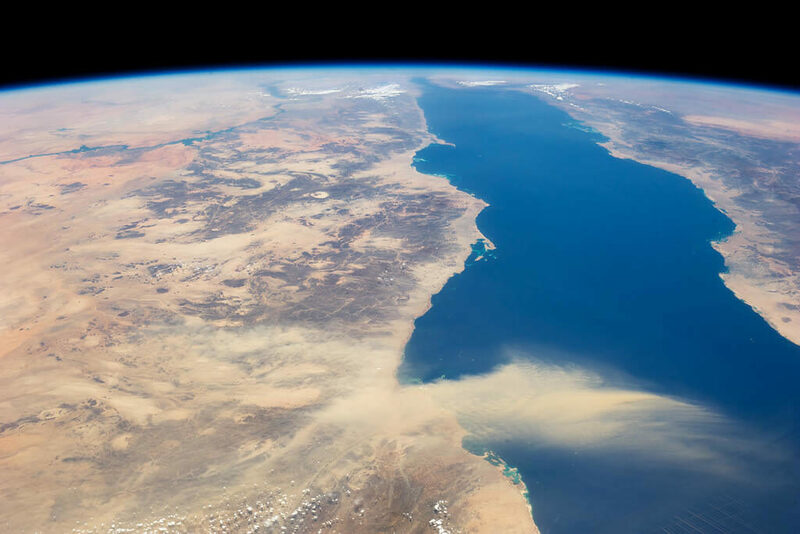 Most proponents equate the body of water that the Israelites crossed, named Yam Suph in the Biblical account, with the Red Sea’s Gulf of Aqaba, limiting the number of options available for crossing candidates. The location of the Exodus’ Red Sea has been the subject of debate for many years. In the maps section of many Bibles, one may notice that the route marked on the map to the traditional Mount Sinai location frequently does not have the Israelites crossing any part of the Red Sea. Rather, the crossing point is somewhere north of the Gulf of Suez, or at a site even further north, the great bitter lake. The theory of a bitter lake crossing, or even a crossing near the Nile delta, seems to have more weight because of the length of its existence rather than how it fits into the Exodus story. In a documentary with Bob Cornuke and Larry Williams, who traveled to Jabal Maqla in 1988, Biblical Scholar and Professor Ken Durham states that if the bitter lake is where the Hebrews crossed the water, Pharaoh would have most certainly had his forces divided and sent to both sides of the lake to cut the Hebrews off. However, as Josephus describes in The Antiquities, the sea was before the Israelites, mountains on the other sides, and Pharaoh’s army behind them. This bitter lake location doesn’t fit the description. Rather, there are other, more fitting locations for the crossing, but these locations point to an Arabian site for Mount Sinai. B. F. Batto, “The Reed Sea: Resquiescat in Pace,” JBL 102 (1983): 27–35. The most comprehensive study of the Red Sea Crossing possibilities in modern times was done by Dr. Glen Fritz, author of The Lost Sea of the Exodus: A Modern Geographical Analysis. Fritz, who has a Ph.D. in Environmental Geography, personally visited the locations in question. Based on his research, he concludes that the Bible and historical accounts outside of the Bible “clearly” point to the Gulf of Aqaba as Yam Suph. It contradicts the mainstream theory that the Exodus account actually refers to “Reed Sea,” rather than the Red Sea, in order to justify potential crossing sites within Egypt, such as lakes, instead of a body of water large enough to be identified as a sea. The confusion began over 2,000 years ago with the Greek Septuagint Bible, which equated the Hebrew Yam Suph with the Greek concept of the Red Sea. The Greeks were unaware of the Gulf of Aqaba, which caused the Gulf of Suez to become the default site for Yam Suph. The geographical ignorance of the Gulf of Aqaba persisted until the 19th century, allowing the Red Sea tradition to dominate without challenge. who led them through the depths? A lake simply does not fit these descriptions, especially not a marshy and shallow body of water in the Nile delta. Dr. Fritz notes that there are several Biblical passages that identify Yam Suph as the modern-day Gulf of Aqaba and not another body of water. Yam Suph appears in the Hebrew Scriptures 24 times, with 11 of these verses having spatial/geographical content. Seven of these verses link Yam Suph with the historical lands of Edom or Canaan, which were directly north of the modern Gulf of Aqaba. This region is far removed from ancient Egypt. With the traditional term “Red Sea” being replaced with the more accurate Yam Suph, each passage indicates that Yam Suph was closer to the Edomites and Canaanites than the Egyptians. 1 Kings 9:26 – King Solomon also built ships at Ezion Geber, which is near Elath in Edom, on the shore of [Yam Suph]. Jeremiah 49:21 – At the sound of their fall the earth will tremble; their cry will resound to [Yam Suph]. Numbers 21:4 – They traveled from Mount Hor along the route to [Yam Suph], to go around Edom. Deuteronomy 1:40 – But as for you, turn around and set out toward the desert along the route to [Yam Suph]. Deuteronomy 2:1 – Then we turned back and set out toward the wilderness along the route to [Yam Suph], as the Lord had directed me. For a long time we made our way around the hill country of Seir. None of the above verses indicate an Egyptian connection in any way. The references to Yam Suph in these passages show close proximity to Edom and Canaan, but not Egypt, which would be approximately 150 miles to the west, according to Dr. Fritz. This theory is reinforced by the fact that King Solomon built his fleet at Yam Suph in 1 Kings. Why would a fleet be built on a marshy swamp or on a landlocked lake? It makes much more sense that the fleet Solomon constructed was at the Red Sea’s Gulf of Aqaba. Presumably the wise Solomon would not have built his ships on an inland reedy lake, since he would not have been able to get them out! The precise locations of ancient Elath and Ezion Geber are uncertain, although many scholars believe that Elath was in, or close to, modern Aqaba in Jordan, on the northeast side of the head of the Gulf of Aqaba. 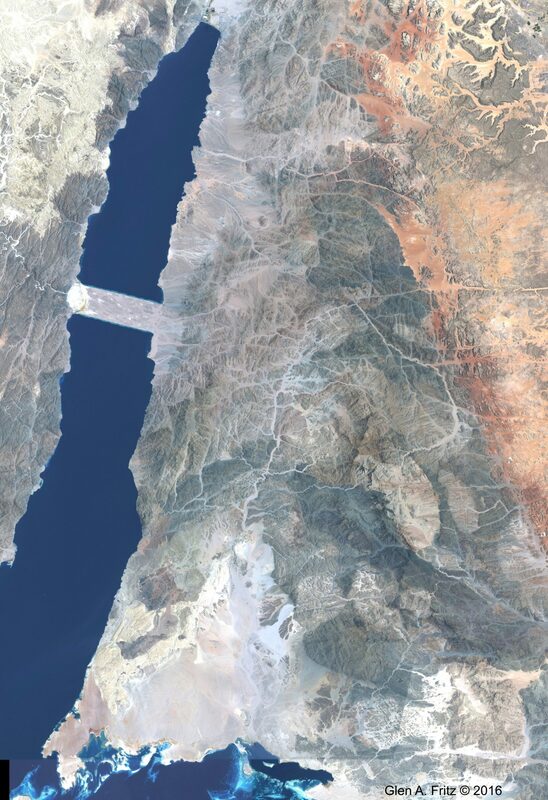 However, we do know that ancient Edom was a country adjacent to the Gulf of Aqaba, hence we can say with reasonable certainty that the biblical yam suphis the Gulf of Aqaba, which is one arm of the Red Sea (the other arm being the Gulf of Suez). Yam suph may refer to other bodies of water as well, but I suggest that it is beyond reasonable doubt that the biblical yam suph includes the Gulf of Aqaba. Professor Humphreys also mentions that the translators of the Septuagint, the Greek translation of the Old Testament, identified the Hebrew Yam Suph as the Eyrthraean (Red) Sea. The translators deliberately did not translate the Hebrew phrase into the words “Sea of Reeds,” and some deference ought to be given to these translators, who were only a mere 140 miles, in Alexandria, from where the crossing took place. What seems to make more sense than the is that Yam Suph is the Gulf of Aqaba, not a marshy lake or otherwise landlocked body of water, and that Solomon built his fleet on that body of water, the same sea that the Israelites crossed several hundred years earlier. Dr. Fritz makes the claim that the word suph is better understood using other meanings throughout the Scripture, phrases like “end,” “cease,” “perish,” “consume,” “fulfill,” etc. A better understanding of Yam Suph, in light of this, is that the sea is the body of water at the end of Israel’s border, which is the Gulf of Aqaba. Joel Richardson, Mount Sinai in Arabia: The True Location Revealed (WinePress Media, 2019), 69. (Quoting Philo of Alexandria). The Red Sea also makes sense as the body of water the Israelites crossed because of the Biblical text’s indication that it is a massive geographic feature. Pastor Mario Seiglie writes that there is no way that Yam Suph was a marshy lake or even a large lake. Rather, only the Red Sea itself fits what the text implies. Notice also Numbers 33, which mentions the stops the Israelites made in the wilderness of the Sinai. After crossing “the sea,” they camped in Marah, then Elim. And “they moved from Elim and camped by the Red Sea [yam suph]” (verse 10). How could they have crossed a “sea of reeds” and, after many days of travel, still camped by that same “sea of reeds”? No body of water in the region except the Red Sea would have been enough for the Israelites to have traveled so long and still be close to its coast. Other descriptions of this route include that it was “off the main road”, a “rough and untrodden wilderness,” and a “pathless track.” This was not an established route by which anyone traveled, by any means, according to these accounts. This body of water where the Red Sea cross took place was simply not in an established location but in a true wilderness setting. The only notable mention of a body of water closer to ancient Egypt is in Isaiah 11, with the Gulf of Suez being referred to as “the tongue of the Egyptian Sea” according to the prophet. A bitter lake explanation doesn’t hold up to closer scrutiny that goes beyond simply accepting the traditional theory as fact. There is, however, additional perspective on Yam Suph that, even if the actual translation was “Sea of Reeds,” makes the Arabian location for Mount Sinai plausible. a sea of reeds after all? Professor Colin Humphreys writes that the Gulf of Aqaba is a unique body of water. The Red Sea is a saline body of water, and reeds tend to not grow in salty water. However, there is a strange phenomenon at the northern part of the Gulf, as observed by one explorer in the early 20th century. What is the origin of the water in these freshwater springs at the head of the Gulf of Aqaba? It comes from rain water falling on the mountains bordering the Arabah. The water is then funnelled along and under the sand of the Arabah down towards the Gulf of Aqaba, where it breaks out on the seashore as freshwater springs. If reeds grow in the body of water we know as the Red Sea, the contention that Yam Suph is actually a Sea of Reeds, and it literally refers to a sea that had reeds in the water, Humphreys’ assertion could make the pieces fit together coherently. One additional piece of input to consider comes from a former British colonial governor of the Sinai Peninsula, C.S. Jarvis. Governor Jarvis extensively studied the Sinai during his tenure, including how it relates to the Exodus. He favors Lake Sirbonis as Yam Suph, but he also makes a most interesting observation about the Sinai Peninsula next to the Gulf of Aqaba. It is interesting to note that the Mohammedans believe that the disaster occurred on the opposite side of Sinai in the Gulf of Akaba, though what the Egyptian army were doing there remains a mystery. Claude Scudamore Jarvis, Yesterday and to-day in Sinai (Edinburgh/London: W. Blackwood & Sons, 1931), 162-163. The most-favored theory among those who believe Mount Sinai is in Saudi Arabia is that the Red Sea Crossing happened across the Gulf of Aqaba at Egypt’s Nuweiba Beach, which is located about half-way down the Sinai Peninsula. Dr. Fritz is a leading advocate of this site. The large size and placement of Nuweiba Beach make it distinct to viewers using Google Earth. It is large and flat, and isolated by mountainous terrain on three sides, but is reachable through an indirect, narrow path through the mountains from the northern part of the Sinai Peninsula. The book of Exodus says that the Israelites crossed at a place where “the wilderness had shut them in” (Exodus 14:3). The 1st-century Jewish historian Josephus clarified that the crossing point was mountainous, which would have trapped the Israelites in on three sides. If Nuweiba Beach is the correct crossing point, the Israelites indeed would have been trapped if Pharaoh’s army was following them through the Wadi Watir entry to the beach. Accessible and spacious opposing beachheads with travel routes to or from the interior regions. Topographical barriers limiting escape routes from the beachhead encampment. Unprecedented explorations of the seabed along the Nuweiba underwater land path to Saudi Arabia was conducted in the spring of 2001 by Dr. Lennart Möller and a team operating specialized, remote-controlled cameras for videography. Dr. Möller is a professor of medical sciences in Sweden with an interest in marine biology and archaeology and author of the tome, The Exodus Case. He says that the coral formations are unique from corals in other parts of the world he’s observed. 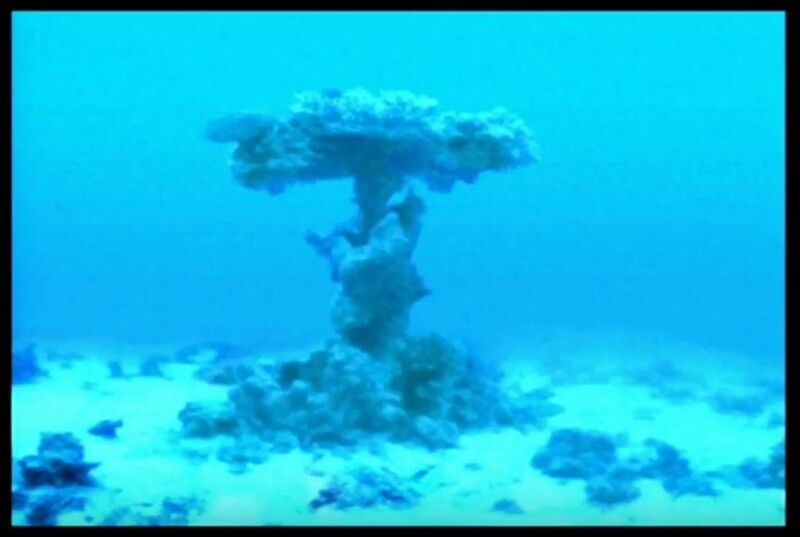 He described the seabed as resembling a “junkyard” with coral formations having 90-degree angles and circular shapes that indicate man-made objects. He believes that the debris of the Egyptian army became encrusted by the coral, which retained the shape of the objects it grew upon. The most distinct coral formations resemble chariot wheels and chariot cabins. (See the gallery below). In his book, Möller refers to two coral formations that resemble chariot wheels with six spokes and others with four and eight spokes. He believes these formations support placing the Exodus around 1450 B.C., as that’s the only time where Egypt’s army utilized all three types of chariot wheels. He also points to possible remains of human and horse skeletons, among other coral shapes. A researcher named Aaron Sen has dived at Nuweiba hundreds of times and has observed the coral shapes. He agrees that the coral formations are unique from other locations with coral that he has seen while diving. Sen brought a metal detector on own expedition to test some of the formations resembling wheels. He says that the positive readings within the formation are consistent with the shapes of chariot wheels. There is a strong local tradition within northwest Saudi Arabia of the crossing happening in this general location, including rumors about Saudi officials having found chariot wheels deep in the waters. Dr. Fritz is more cautionary about linking the finds to the Exodus story because of the great difficulty in proving the connection. It is possible that encrusted chariot wheels and skeletal remains are attributable to shipwrecks or other seaborne activity in the area. Unfortunately, proper research is prevented by Egyptian and Saudi regulations. The Egyptian government prohibits the retrieval of coral or underwater objects. The Saudi government is more prohibitive of such explorations in general. In 2017, Ryan Mauro and associates of the Doubting Thomas Research Foundation visited the Saudi site of the alleged crossing site. Saudi police appeared and prevented any diving in the specific location of most interest. The Saudi police maintained their presence until the researchers left the area. Bob Cornuke of the Biblical Archaeology, Search, and Exploration (BASE) Institute proposed a 12-mile crossing from the southern Sinai Peninsula from Sharm El-Sheikh into Saudi Arabia via the Straits of Tiran in the early 1990s. Cornuke points to a shallow, underwater land path from Egypt into Saudi Arabia and has pictures of him standing in it, demonstrating how Moses and the Israelites could conceivably walk into Saudi Arabia if the waters parted. The theory is most persuasive when looking at satellite imagery from Google Earth. An overhead view of the terrain shows a possible route heading south along the western side of the Sinai Peninsula, then eastwards towards the crossing point at Sharm El-Sheikh. It visually appears that this route is wide enough to have accommodated the large Israelite population and the Pharaoh’s army. Critics of this theory argue that there is a large gap interrupting the proposed underwater land path. Unless this gap came into existence after the Exodus, the Israelites would not have been able to cross due to this deep gap. Proponents have suggested that gap may not have existed during the time of the Exodus, as the land may have shifted with tectonic movements. Critics counter that the theory does not align with current knowledge of tectonic plate movements. If the proponents are right, the Straits of Tiran are then certainly a plausible candidate for the crossing site. An exaggerated view of the underwater landbridge that reaches from Nuweiba Beach to the opposite shore. Note the wadi the leads directly to Nuweiba Beach, with mountains enclosing the beach on both sides. Image courtesy of Glen Fritz. Imagery of coral formations on the Gulf of Aqaba’s seabed from Dr. Lennart Möller. 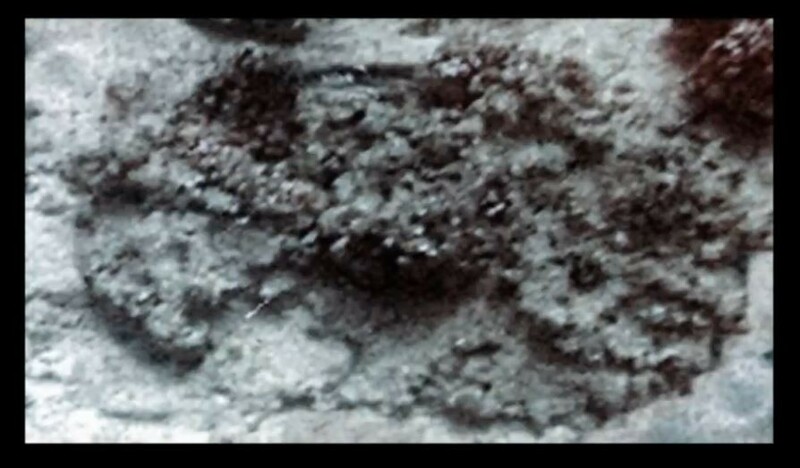 These formations are anomalous, and could be from the remains of Pharaoh’s army. [i] Fritz, Glen A. (2016). The Lost Sea of the Exodus: A Modern Geographical Analysis, Second Edition. Geotech: San Antonio. What is the mean sea level at this just underwater land bridge? At what velocity does the water begin to pile up and away fm the area to form dry land? From what direction does the wind need to blow, and does this happen every now and again in this area? Much of what is currently being researched on this site, has already been discovered and proven by Ron Wyatt in the late 1970’s.! In this research, still no mention of the 2 towers built by King Solomon marking the crossing. Yes, it’s Arabia.